We make our sausages in store using meat from Gloucester Old Spot pig farmed in Suffolk. 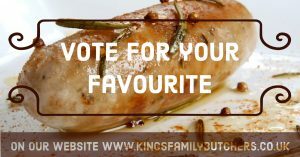 We offer range of classic flavours such as Plain, Cumberland or Old English, as well contemporary flavours including Smoked Chilli & Paprika, Pork & Apple or Caramalised Onion & Red Pepper. What’s in store will vary from week to week so why not pop in to see our display of produce. Seasonal flavours are also available. For example, Pork & Chestnut at Christmas or try a taste of Meditteranean during the summer months. Gluten free sausages are also usually in stock or available to order.